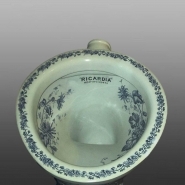 A sanitary ware water closet, with underglaze printed decoration in the dark inky blue so popular in the late 19th century. The exterior with a large spray of flowers the height of the WC; the rim with a circlet of flowers; inside the bowl with two large floral sprays. The name Ricardia and the registered number 240441 is printed on the inside of the bowl below the rim, indicating that the design for the pattern or for the shape was registered by Edward Johns in 1894.